Oh my, how the time does fly. I've been working on this quilt for over 2 years now! It was a project started in order to play with an improv. method from Sujata Shah's 'Cultural Fusion' book. Finishing it up at the time of the Bloggers Quilt Festival made it a shoe-in for entering! I liked funky pinwheel look to the blocks, but it just seemed like they needed a bit more focus. Thus the idea of trimming the edges and giving them more of a 'wheel' look. I do tend to veer toward a more circular look at the slightest provocation. Then of course, the centers appeared to be in need of a brighter, more unifying color, of which I was happy to oblige them with. But what to do about those white, vacant looking connecting squares? That yawning emptiness? It only seemed right to add a busy little bird and on and on like that, it just happened. This quilt seemed determined to tell its own story and it was my job to figure it out and narrate it properly. Improv. Wheels finally a finish! The entire quilt was hand quilted in perle cotton #8 and #12, my go-to threads for the last couple years. It's part and parcel of what tipped the scales in the direction of being happy with the ultimate finish. Hand quilting texture in a quilt is just so very yummy. 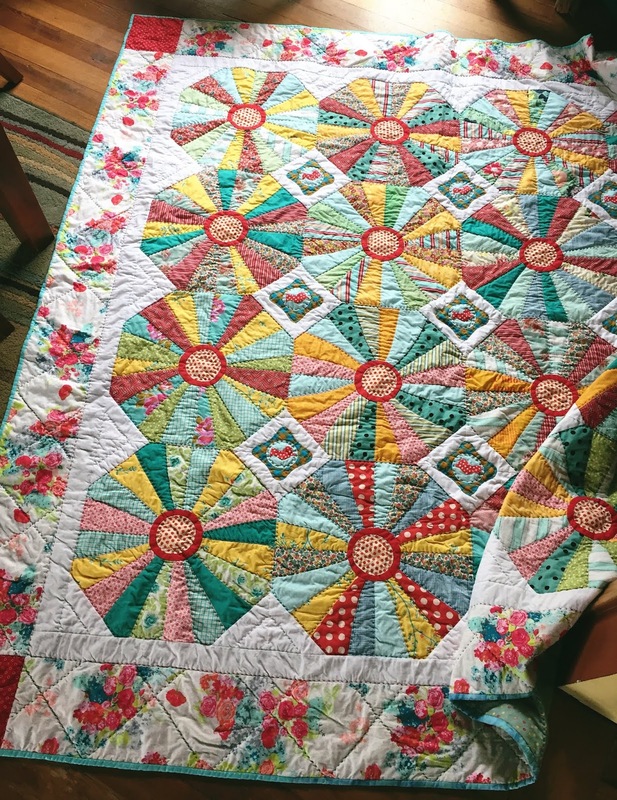 I'm quite the addict by now and still have to grin when I think of those years when I was so vocal about never, ever hand quilting anything! I'm also very pleased with the recycled mens shirts included in the quilt and the one vintage piece of fabric I bought special at a quilt show a few years ago. I don't do much of that, but it always feels good. Plus, as an added bonus, there are many oldy, moldy fabrics in this quilt that have been languishing in the bottom of the stash totes for sooo many years that it feels quite ridiculous at times. There is a very real resistance to throwing out fabrics on the basis of 'Well, I haven't used them thus far, so I probably never will!'. Oh no. That's just like waving a red cape. Throw a few beautiful new fabrics in with the lot and just wait and see what I can come up with. Challenge thrown down, challenge accepted! 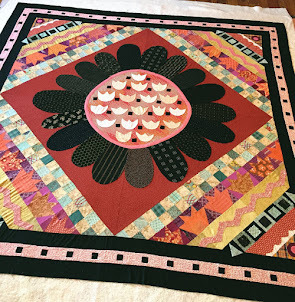 *wink Now to find times to peruse all the wonderful quilts over at Fall 2018 Bloggers Quilt Festival. Always a good time to find new inspiration! That's an easy pick . . . it is amazing! 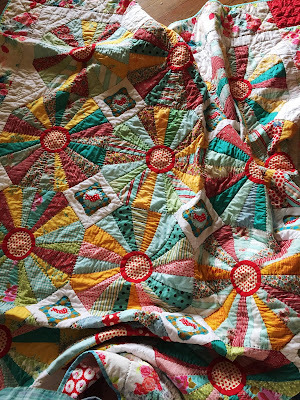 I love the colors, the fabric and the pattern and the quilting are incredible. I love this quilt!! 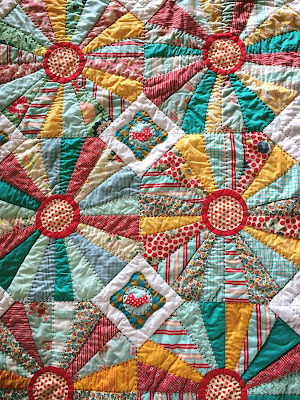 It’s so happy :0) I love the little bird detail, the centre circles, vintagy border fabric and I really love all the gorgeous handquilted texture. Very snuggly looking indeed! 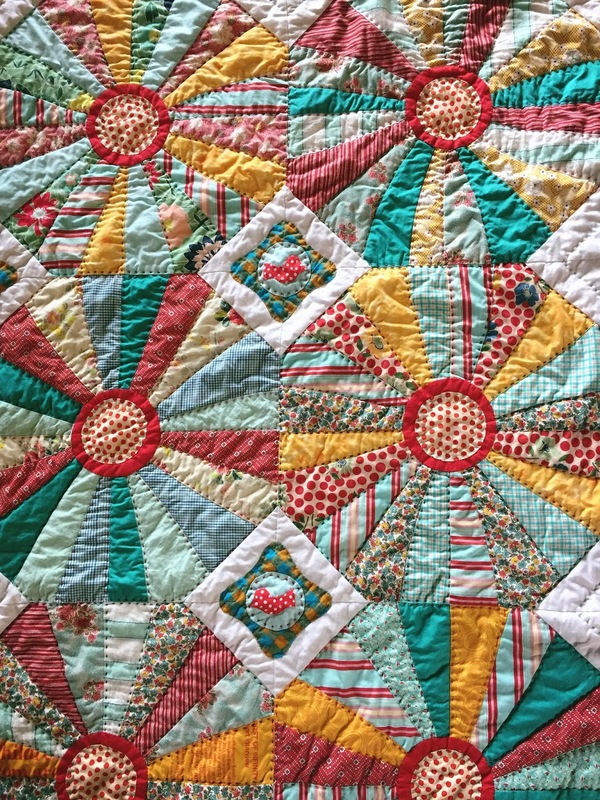 fun quilt - I like the color scheme very different and happy. Nice touch adding recycled bits. I am about to teach Sujata's design at my LQS and I'd would love to share your enhanced version with the students (with your permission). You added so many wonderful elements - I love it!! My favorite scrap quilt so far...love it! I would love to make this someday! It's a delightful quilt. Love all the detail, the colors and of course, your special touch. What a happy quilt! Love the colors and that little extra something you added in between the wheels. Perfect! Wonderful border, too! Love this quilt, so scrap happy with all its litte 'Audrey extras' ! 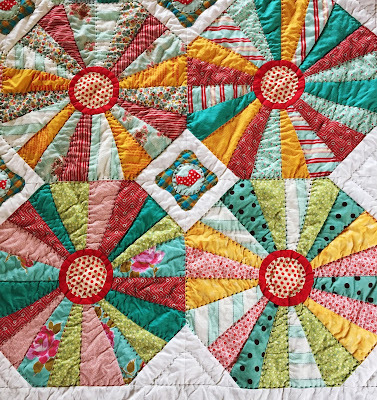 What a dynamic quilt, and the border is playfully whimsical, just like you planned it! 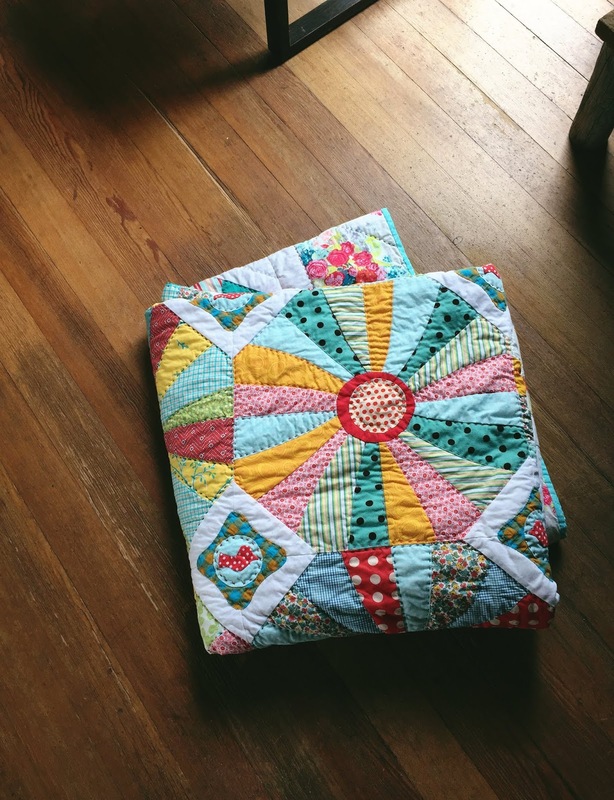 I love anything that even slightly resembles a Dresden Plate, and this quilt is so colorful. It makes me think of carnival or circus tents, which is a good thing. 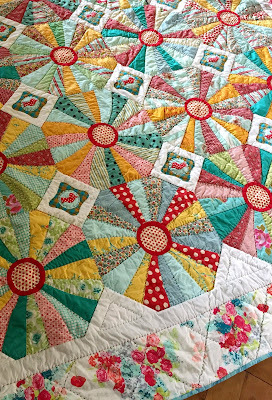 As always with your quilts it's the combination of all those extra little touches that create something really special. Lovely to revisit this one. Love the colors and the design! So much fun! I admire the way you altered the wheels to suit yourself. Adding applique makes it so personal. You remind me to keep using my old fabrics. Absolutely right that adding something new refreshes them beautifully. 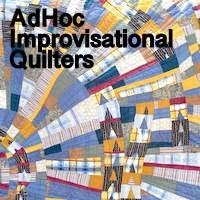 And they make quilts so unique. Thanks for sharing this again. I must not have been a follower when you claimed you would never hand quilt. 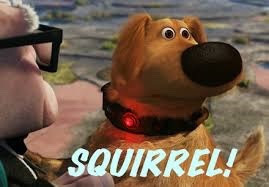 Who knew?!! Love the quilt Audrey, the birds are perfect! What a fun quilt! May not be your colors, but it looks great! I too, have only followed you as a hand quilter. I'd love for you to write a blog post about how that evolution took place (or direct me to old posts). That would be really interesting especially as it often seems the evolution is usually in the opposite direction. Hand quilting looks the best but is so time intensive. I wish I was faster. Fabulous choice for the festival! Bright, happy and full of life! The colors in this quilt are so very interesting. I like how you have some stripe pieces in it and the stripes go different angles. Draws the eye in. 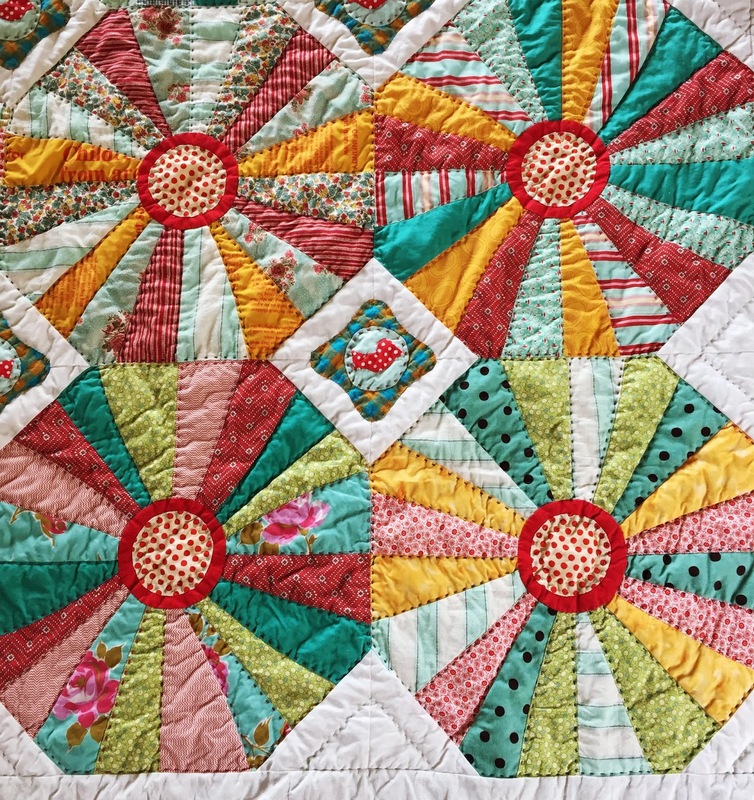 What an exuberant quilt with lots of energy. I always think you are so brave with color. I especially like the border fabric you chose. Beautiful quilt!